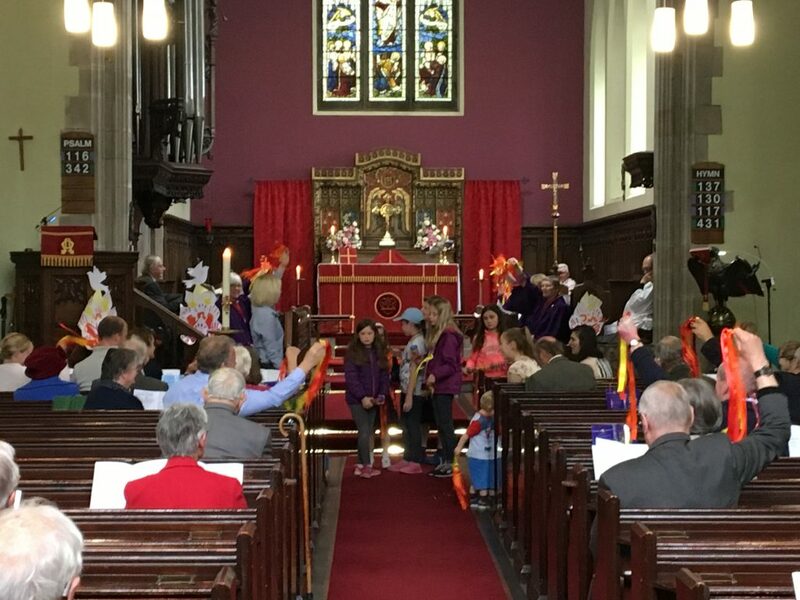 This week we look back to the service on Sunday 20th May 2018 Elaine Cromwell, aided by the Young Church, told the story of the Pentecost with some colourful props and congregational participation. Here is the text of her talk. ‘So children, what can you notice that is different about the church today? Yes, we are using the colour red today. That’s because today is a special day called Pentecost. It’s the day in the church when we remember when God the Father and Jesus, God the Son, sent us a very special part of God – God the Holy Spirit, to be with us always. Jesus had promised his followers that he wouldn’t leave them alone when he went to be with his father, and that he would send a very special helper. We call that special helper the Holy Spirit. In the first reading, we heard about how the Holy Spirit arrived. Did the Holy Spirit just sneak up on the disciples and sit down quietly? Oh no – the Holy Spirit arrived with some drama. Maybe I could ask the Young Church to help me show the congregation how it went? Youth Fellowship as well as some very special helper friends from Rachel’s Mum’s and her group from Fife Council helped us make these fabulous steamers. These will remind us of the flames that came when the Holy Spirit arrived. We also have some shakers here. These will help us experience the wind that rushed through the rooms that the disciples were gathered in. So we need to give these out to some willing victims, Imean helpers in the congregation. Remember to keep a streamer or a shaker for yourself too. Ok, so Young Church, why don’t you follow me up to the back of the church. So we heard in the story how the disciples were all sitting in the room feeling a bit down because they thought Jesus had left them and they were all alone. Feeling a bit frightened and scared about the job that Jesus had left them to do – go and spread the word about God’s love. The children run down the aisle shaking shakers. Little flames appeared and rested on them. Jesus’s friends all started talking in other languages – languages they had never been taught but could suddenly speak! Gutten Tag! Wie gehen Zie? Bon jour! Comment allez-vous? Suddenly the room was filled with energy and power. And Peter understood what was happening. God was pouring out God’s spirit to fill the disciples and followers of Jesus with the words to speak to many people about the special thing that Jesus did for us all and God’s great love for us all and what is really important to remember is that this coming of the Holy Spirit wasn’t just for the 11 special fiends of Jesus, but for all the friends of Jesus – so that includes everyone in this room too. So when we think about the Holy Spirit, we think about energy and power. We think about being ‘inspired’ – literally filled with the spirit. It’s about becoming motivated to do work for God. To tell others about the great power of God’s love. If any of you watched the royal wedding yesterday, you would have witnessed the energy and power of the Holy Spirit at work in Episcopal Bishop Michael Curry as he gave his arousing and energetic sermon on the power of love. For me, this was indeed inspirational and lifted me up. But the Holy Spirit is sent to us as a helper in other ways too – not just as an inspirer or motivator. Other names for the Holy Spirit include advocate, witness, teacher, counsellor and comforter. In our English language we get the word comforter from a Greek word parakletos which means being called to the side of someone. In other words, to be there for someone, to be a quiet and steady support. And while in the stories today, the Holy Spirit filled the disciples with many words, words in languages they didn’t even speak – in order to spread the message of God’s special love for us, there are times in our lives where we can feel that we don’t have the words to speak to others, when we can’t even find the words to speak to God. It is at these times of our lives that we must remember the Holy Spirit is our comforter. At the times in our lives where we cannot find the words, we need only take a deep breath. That deep breath reminds us of the rush of wind which signalled the arrival of the Holy Spirit and that fills us too. At times, yes, it can fill us with energy and power but at others, it fills us with the love and comfort of God. This week was Mental Health Awareness week in the UK. And BBC Scotland revealed earlier in the week that nearly three quarters of all adults in Scotland in the last year, have felt unable to cope due to feelings of stress. Stress has become almost a ‘normal’ feature of everyday life. But we know that prolonged periods of stress can have serious consequences for our mental and physical health. I know that sometimes when I am stressed it seems like I even forget how to breathe. It’s times like that when we need to remember that we are not in this alone. We are supported, we are heard and we are comforted – by the Holy Spirit – and just breathe. The last time I spoke to you I told you a bit about my childhood – about my Mum’s button box and my Dad’s duffle coat. I’d like to finish today with another story from my childhood – one which many of you, young and old, will relate to, I’m sure. Meet ‘Wee Ted’. Wee ted is 47 years old and was my special teddy when I was a child. Now to understand why he is called Wee Ted, I need to put this in context for you. I also had ‘Big Ted’. Holds up big teddy. This isn’t the original Big Ted. Sadly the original Big Ted met a sudden demise involving pram wheels, circa 1975 but you get the general idea. I think Luke should maybe have big ted. In fact I’ve got some other teddies in this bag here and I think the Young Church should help me give these out to some of the grown-up. I can see they want nothing more than to clutch a teddy at church. I had lots of teddies when I was growing up and I especially remember as a little girl being tucked up in bed with my teddies surrounding me. This was before the days of duvets and central heating so in the winter especially, I was tucked in tightly with heavy blankets and a rag quilt on top, water bottle at my feet, to keep me warm and cosy in bed. Once I was all tucked in, my Mum or Dad would read me a bedtime story. And here’s one of the books that I had growing up. It’s got lots of stories in it, including one of my all time favourites, the Selfish Giant by Oscar Wilde. I’ll read it to Young Church one day soon.